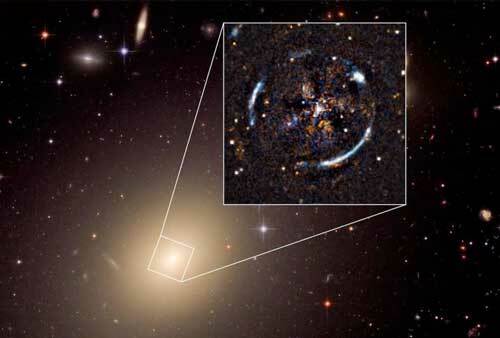 (Nanowerk News) Using the MUSE instrument on ESO's VLT , a team led by Thomas Collett from the University of Portsmouth in the UK first calculated the mass of ESO 325-G004 by measuring the movement of stars within this nearby elliptical galaxy (Science, "A precise extragalactic test of General Relativity"). Collett explains "We used data from the Very Large Telescope in Chile to measure how fast the stars were moving in ESO 325-G004 -- this allowed us to infer how much mass there must be in the galaxy to hold these stars in orbit." But the team was also able to measure another aspect of gravity. Using the NASA/ESA Hubble Space Telescope, they observed an Einstein ring resulting from light from a distant galaxy being distorted by the intervening ESO 325-G004. Observing the ring allowed the astronomers to measure how light, and therefore spacetime, is being distorted by the huge mass of ESO 325-G004. Einstein's general theory of relativity predicts that objects deform spacetime around them, causing any light that passes by to be deflected. This results in a phenomenon known as gravitational lensing. This effect is only noticeable for very massive objects. A few hundred strong gravitational lenses are known, but most are too distant to precisely measure their mass. However, the galaxy ESO 325-G004 is one of the closest lenses, at just 450 million light-years from Earth. Collett continues "We know the mass of the foreground galaxy from MUSE and we measured the amount of gravitational lensing we see from Hubble. We then compared these two ways to measure the strength of gravity -- and the result was just what general relativity predicts, with an uncertainty of only 9 percent. This is the most precise test of general relativity outside the Milky Way to date. And this using just one galaxy!" General relativity has been tested with exquisite accuracy on Solar System scales, and the motions of stars around the black hole at the centre of the Milky Way are under detailed study, but previously there had been no precise tests on larger astronomical scales. Testing the long range properties of gravity is vital to validate our current cosmological model. These findings may have important implications for models of gravity alternative to general relativity, that have also been invoked to explain the accelerated expansion of the Universe. These alternative theories predict that the effects of gravity on the curvature of spacetime are "scale dependent". This means that gravity should behave differently across astronomical length-scales from the way it behaves on the smaller scales of the Solar System. Collett and his team found that this is unlikely to be true unless these differences only occur on length scales larger than 6000 light-years. "The Universe is an amazing place providing such lenses which we can use as our laboratories," adds team member Bob Nichol, from the University of Portsmouth. "It is so satisfying to use the best telescopes in the world to challenge Einstein, only to find out how right he was."